Facebook lead ads can accomplish a variety of marketing objectives, but they’re best at helping with one of marketing’s golden rules: Know thy audience. Many marketers think they know their audience, but often confuse customer data with customer analytics. In a mostly online ecosystem, it’s easy to forget that sometimes the best way to learn about customers is to just ask questions. That’s exactly what Facebook lead ads (sometimes called Facebook lead forms) do. If your objectives include market research, customer feedback, or even increasing conversions, Facebook lead ads may be the right solution. This guide will answer all of your questions about the ad format, including how to create a campaign and how to optimize for success. Facebook lead ads are essentially promoted forms. These forms allow marketers to capture details from customers while offering opportunities to connect, such as newsletter subscriptions, demo requests, or contest registration. 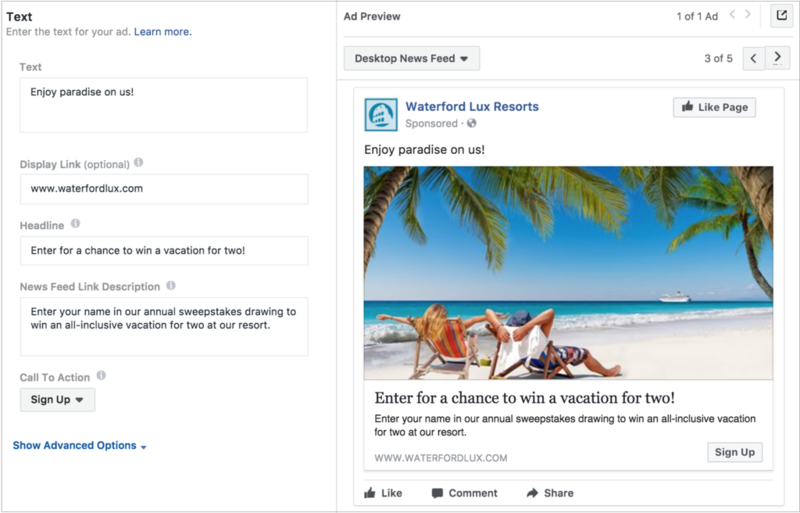 When someone clicks on a lead ad, they presented with a form that’s pre-populated with information from their Facebook profile. The rest can be completed in a few easy taps. A major attribute about lead ads is that they are optimized for mobile. That’s key for Facebook’s 88 percent share of mobile users–especially since it typically takes 40 percent longer to complete forms on desktop. 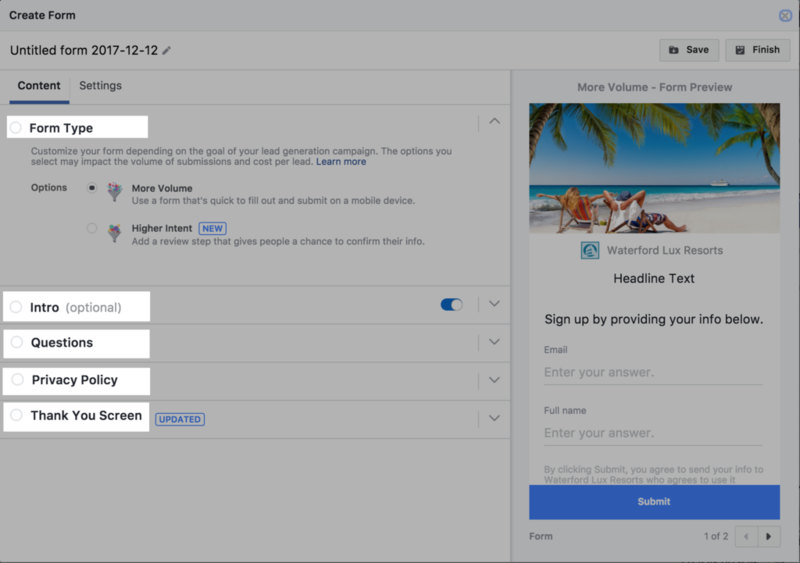 Another advantage Facebook lead generation ads offer is that generated leads can be synced directly with your company’s customer-relationship management system or downloaded as a .CSV file. This allows marketers to follow-up more efficiently, which is vital for closing the deal. 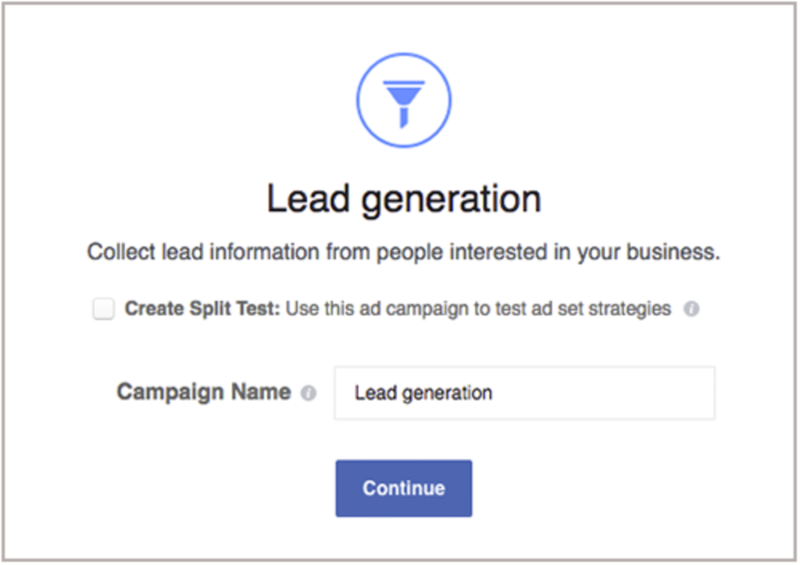 Here’s how to set up Facebook lead generation ads, step by step. 1. Go to Ads Manager. 2. In Ads Manager click Create in the top left corner. 3. Choose Lead generation as your objective and name your campaign. 4. Choose the Page you plan to use for the lead ad. Click View Terms and then agree to the Facebook Lead Ads terms and conditions after you’ve read them. 5. Choose your target audience, placements, budget, and schedule. Note: Lead ads cannot be targeted to people under the age of 18. 6. Select your lead ad formats. You can select carousel, single image, video, or slideshow. 7. Add your headline, body copy, and a call to action. A window on the right offers a preview of your ad as your create it. Intro: Use this section to clearly explain why people should fill out your form. Form type: Under Form Type you can select: More volume or higher intent. Choose more volume if your campaign goal is to get the form completed by as many people as possible. Selecting higher intent adds a step to your form that allows people to review and confirm their info before they hit submit. This is a good option if your objective is to seal a deal. Thank you screen: This screen will appear after the form is submitted. You can also include a call-to-action or download link here. 9. Click Settings under the name of your form and check that you would like to collect organic leads. This advanced step is optional, but recommended. You can also change the language of your form here. 10. Click Finish in the top-right corner. Review your ad from Ads Manager and when you’re ready to publish, click Confirm. Once you’ve created an ad, you can access leads through, customer system integration, implementation of the Facebook Marketing API, or by manual download. 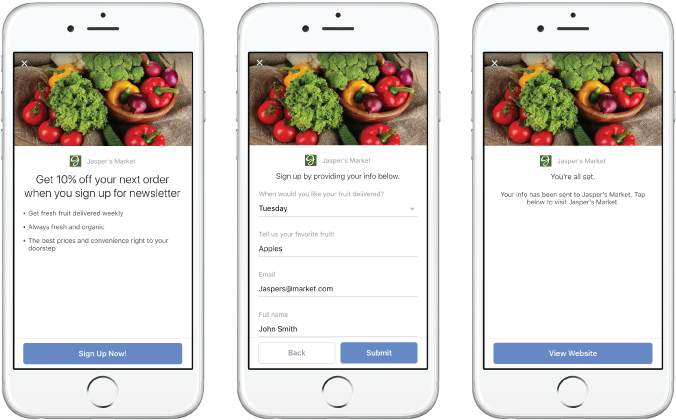 Facebook also allows advertisers to collect leads using Facebook Instant Experience forms. People are more willing to share their personal information with you if you offer something in return. Whether it’s a promo code or a free download, a good incentive shows customers you value their information. Share your value proposition upfront so that people understand what they are signing up for. 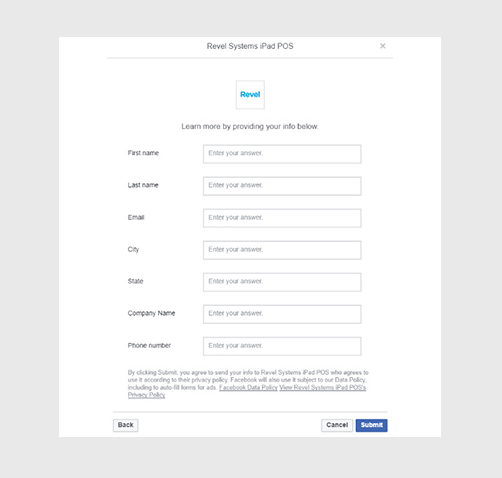 While optional, Facebook recommends you include this information in your promotional copy and in the introduction at the beginning of your form. Also, add branding throughout the experience so there isn’t any ambiguity as to who people are sharing their info with. It’s also important to choose imagery that supports your messaging. 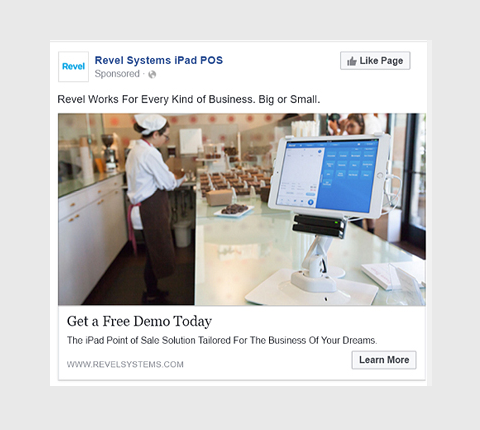 For instance, point-of-sales systems provider Revel Systems tested different creative for its lead ad campaign, and found images with the product as a focal point were much more effective. Just like any other Facebook ad, lead ads best served when the medium fits the message. For instance, if you want to showcase multiple products or features, perhaps a carousel format is the best choice. Short video, on the other hand, is a good format for storytelling and increasing brand awareness. Don’t assume that because you’re offering an incentive creative doesn’t matter. Include high quality images and videos, sharp copy, and a CTA button for best results. You can find lead ad design specs here. It’s simple: The easier your form is to fill out, the higher your completion rate will be. According to Facebook, with each question you add, the chance of someone abandoning the form increases. Only ask for the most relevant information. If your form includes multiple-choice questions, limit the number of choices between three and four. 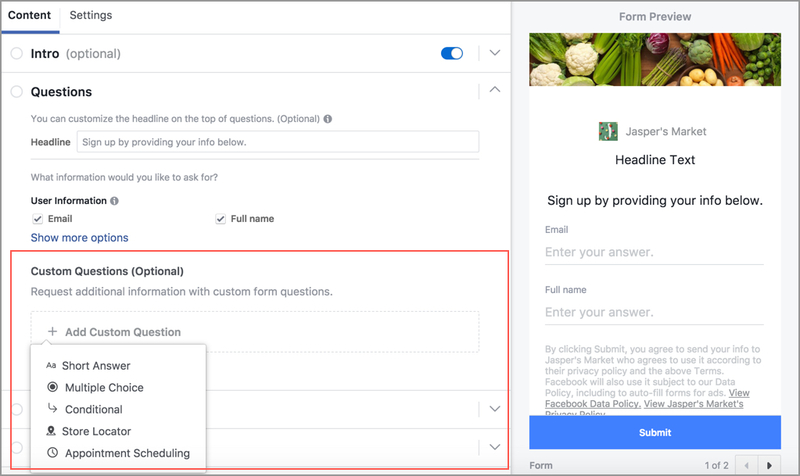 If Facebook’s provided questions don’t meet your needs you can create custom questions for your form. Choose between short answer, multiple choice and conditional questions, which change based on how a previous question was answered. Your form can also include Store Locator and Appointment Scheduling fields which let people search for a nearby location or schedule visits. Need help brainstorming questions? Facebook’s rubric of business goals and examples is a good place to start. Lookalike audiences: If your goal is to expand your customer base, create a Lookalike Audience modeled off of your most valuable customers in order to find similar users. Learn more about how to use lookalike audiences. People near you: If you have one or more locations and your account is managed by a Facebook representative, you can use the business locator feature and target ads to people in range of your stores. This audience segment is ideal if your aim is to schedule appointments, demos, or simply encourage customers to visit. Custom audiences: Examples of custom audiences can include people who are subscribed to your newsletter, recent site and app visitors, or people in your CRM. A swift follow-up can significantly improve the chances of a conversion. And the quicker you do it the better. A landmark study published in Harvard Business Review found that businesses that make contact with customers within an hour are seven times more likely to secure qualified leads. Keep in mind that messaging apps are now consumers’ preferred way to connect with brands. Two-thirds of customers rank messaging ahead of phone, live chat, and face-to-face communications. Maybe it’s time for your business to hop onto Facebook Messenger. And of course, if you want to know your customer’s preferred time and means of communication, don’t forget to ask. The best lead ads are often the result of A/B testing and fine-tuning. Consider running two lead ads with different imagery or copy. Or try running lead ads with different form lengths to measure completion rates. 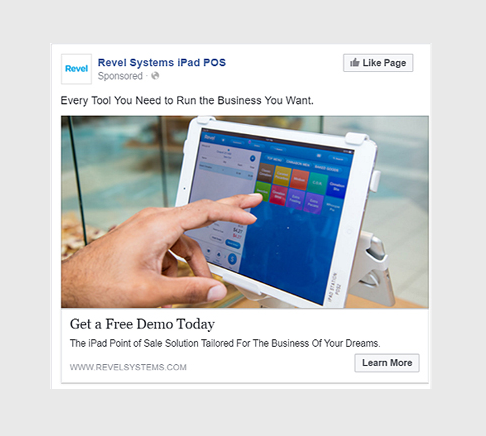 Here are some Facebook lead ad examples to inspire your next campaign. 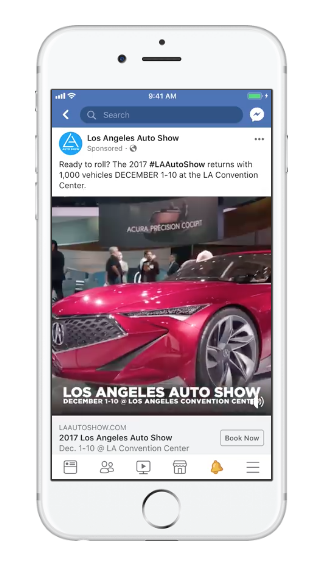 The LA Auto Show ran multiple Facebook ad campaigns to promote its marquee event, but lead ads were critical for revving up interests. To find auto enthusiasts and increase ticket sales, LA Auto Show created a lead ad campaign targeted to a lookalike audience similar to those who had already purchased tickets online. The lead ads offered a ticket discount incentive for those who submitted the form. And critically, LA Auto Show representatives followed up to complete the sales, contributing to a 37 percent increase in online ticket sales compared with the previous year. 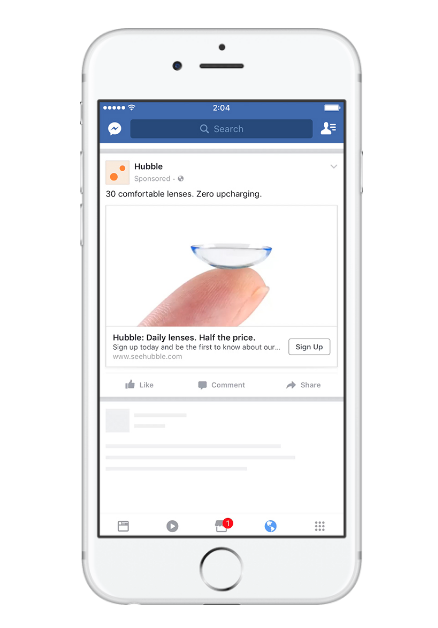 To assess market interest in affordable disposable contact lenses, Hubble Contacts leveraged lead ads to create a simple sign up form. All the company asked for was for people to submit their pre-populated email address if they were interested in learning more. While the company hadn’t launched yet, these insights played a critical role in raising funding. “The data from this campaign was key to raising a USD 3.7 million seed bridge before launch, which gave us the capital to lean heavily into marketing from day one,” said Co-CEO Jesse Horowitz. When Hubble launched was able to use its email list to create ads optimized for conversions. 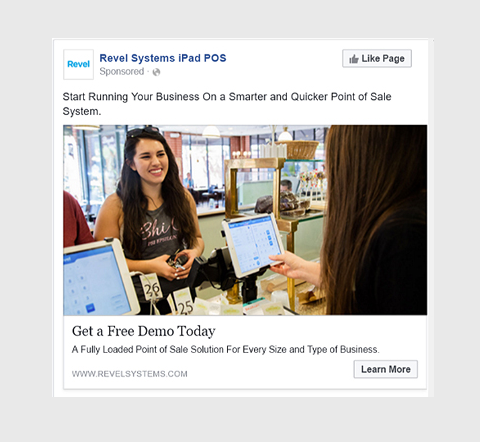 With the goal of generating more customer leads for its point-of-sales system, Revel Systems tested lead ads against link ads that directed people to a campaign landing page. Early results showed that the in-app lead ad format led to 619 times the amount of leads and a 74 percent lower cost per lead. The company also tested different images, finding that images that focused on the product performed better. 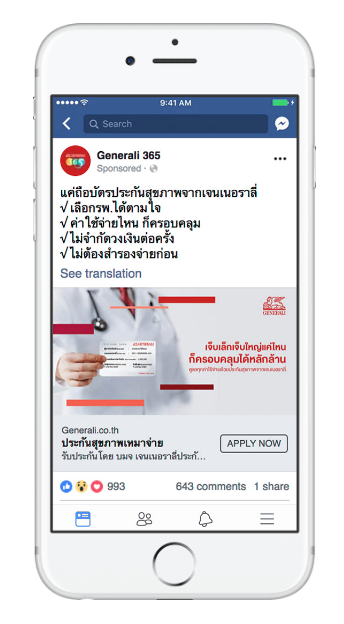 To improve its response time to new customer queries, personal insurance company Generali Thailand ran a lead ad campaign that integrated leads with its CRM management system. The pre-populated forms and automated collection of customer information helped take the burden off of sales team agents, helping them identify and respond to new queries faster. By acting on Facebook leads within 24 hours, Generali Thailand saw a 2.5x increase in sales conversions. 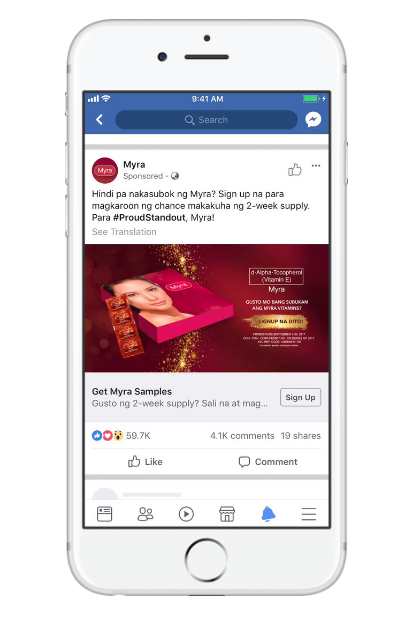 The UL Skin Sciences brand Myra is a big brad in the Philippines and was able to grow its national customer base through offering samples offline. To grow its business online and reduce costs, Myra turned to Facebook lead ads. Using lookalike and custom audiences, the beauty brand targeted an existing customer base and a new qualified customer segment. The campaign was able to secure 110,000 sign-ups at a 71 percent lower cost per sign-up rate. 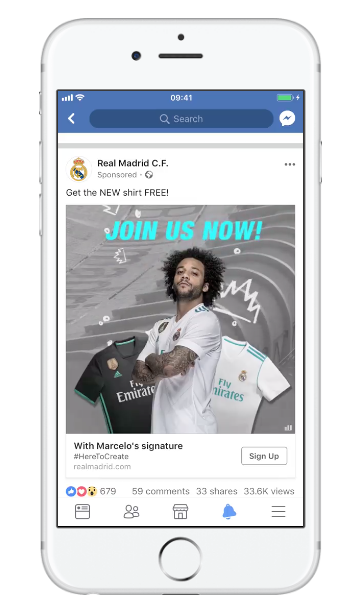 Champions League soccer team Real Madrid has a loyal fan base on Facebook, and an even stronger one offline. To bridge the gap and grow its base in countries with low engagement, the club launched a series of lead ads. Optimization played a big role in the three-month campaign through a series of A/B tests that compared audiences, creative, and formats. At the end of the allotted period, the club generated a whopping 2.4 million leads, and was able to achieve a 70 percent decrease in cost per lead. Create Facebook ads and collect leads using AdEspresso by Hootsuite or Hootsuite Ads. Both are powerful options that make it easy to create, manage, and optimize campaigns. The post How to Use Facebook Lead Ads to Grow Your Business appeared first on Hootsuite Social Media Management.